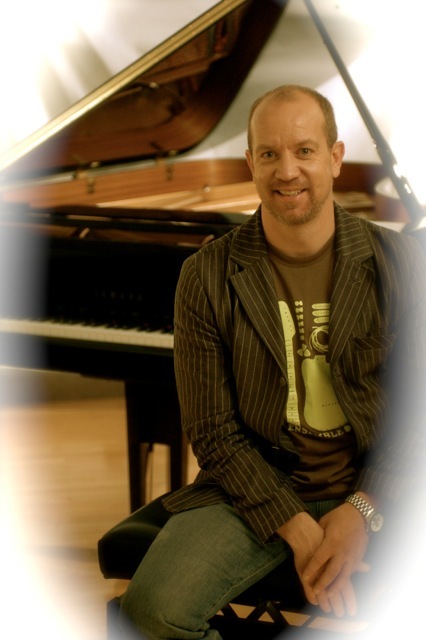 Los Angeles based vocal coach David Stroud is one of the foremost experts of voices. Before opening his current studio, Stroud was the CEO of Speech Level Singing International , and is currently CEO of DS Vocology LLC. A singing teacher to the stars, he was commissioned during the American Idol Season 8 tour as a vocal teacher for touring idols. His latest creation is a voice instruction app called VocalizeU. Coach to coach, we spoke a bit about the new invention, David’s experiences as a voice student himself and his patented approach to singing technique. Photo: Chuck Myers, courtesy of David Stroud. Ruth Gerson: What is one of your most memorable moments as a voice student? David Stroud: I think the most memorable, enlightened, biggest changer piece of information given to me was when one voice teacher told me I needed to stop singing as a baritone and sing like a tenor. Up to that point in my singing, I felt I had to sing big and heavy and letting my natural voice guide me was not what I thought was right. That totally changed my perception of what I thought I could do. 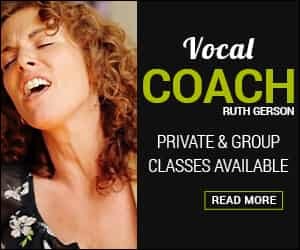 RG: Did you ever have an experience with a student which enlightened your singing technique and approach to teaching voice? DS: Absolutely! The biggest influence on my teaching from a student was and is from teaching Daniel Bedingfield. He has forced me to look at how I disseminate information to others, simply by the way he learns. I think what I have learned from working with him has helped me look at other singers in a new light and helped me learn to read students better. I have always been aware of different learning styles, but really digging into meeting the student at their level and learning style more has come from my teaching Daniel. RG: What was it about Daniel? DS: Daniel is probably one of the most talented and ADD people I have ever met. He wants to learn his way. In fact the first thing he said to me when he came into his first lesson with me was “I f*cking hate voice teachers and I would not be here if it was not for the fact my doctor sent me here.” I laughed and agreed with him… Then it was almost a year before he asked me for my opinion. In the meantime I learned a ton about meeting artists on their level and learn how they learn. RG: You’ve developed a new App called VocalizeU to help vocalists work on their singing technique. How does it differ from apps like Voice Tutor and Singer’s Friend? DS: VocalizeU is much more complex. It’s not just an MP3 player or a video player. Sure it has those features, but it can record all the workouts, vocal warm-ups, etc. and those recordings can be exported. 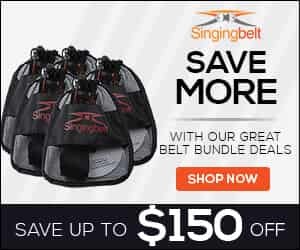 It has real vocal evaluations, it connects to live instructors, it has built in tools for singers such as recorders and metronomes and ear training. It also is interactive, for example in the warm up section, it allows the user to completely control the speed, range, and scale pattern. Beyond the technology, it encompasses my experience and history as an instructor. RG: For a singer who is not yet singing on pitch, will VocalizeU, let them know? Is there tuner technology involved? DS: There is a tuner in the pitch training section. RG: What about a student who might be straining, squeezing or pushing their voice? DS: In the evaluation section it does comparisons of different types of voices and give detailed explanations of why your voice, or the voice you are comparing to sounds the way it sounds. It also has a built in dictionary the helps the singers understand vocalize terms. RG: What are some of the keys to vocal health and stamina? DS: Singing is an athletic experience. It is not so different from any physical activity and singers need to stay in shape with their voice to pull off ongoing singing. However, just like if I go to the gym a lot or play a sport often, but I have poor form, I will do more damage the more time I spend at that activity. So, the key to vocal health and stamina come down to the physical process one is using when they practice or perform. Keeping a balance between the sub-glottal pressure and the amount of closed quotient (within the vocal cord closure) is very important. The difficulty within this lies in the ability to continue to be unique and creative as an artist and maintain as much vocal balance as possible. RG: How can a voice student know when they might be hurting themselves? DS: A singer does not always feel sore or that they have hurt themselves when they are actually doing damage. In general though, if a singer gets hoarse after singing, especially if is chronic, or it takes a day to recover from a performance, there is most likely some level of damage happening. The hoarseness is coming from edema in the cords and that is a result of misuse. The understanding of the vocal bridges and registration of the voice is the answer to this in a pedagogical sense, then application of that to the songs and performances is the long term cure. Again, I will stress the need for a balance of this knowledge to the ability to stay unique and creative and free as an artist. If a singer can sing in a nice balanced fashion, but it either stops them from being unique or they can only stay balanced in the scale work, it does not help, because either they now sound generic or they will continue to have vocal issues every time they perform. RG: So, are you giving singers the “ok” to break the rules to allow for expression and performance, as long as they have gauged through experience what their particular voice can and can’t sustain over time? DS: More or less. If you want to break the rules, do it in an informed way. Show me you know how to stay healthy first. Then we can break the rules and yet know how much and how long we can break the rules and still stay within the framework of good vocal habits. RG: One last singing technique question: you articulate that the larynx should remain completely still as you ascend or descend. Is this an attainable goal for vocalists, or is the goal to aim for stillness? DS: Yes. The short answer is that the larynx should not chase the pitch. Meaning, it should not go up when the singer ascends in pitch or go down as they descend in pitch. The larynx will rise as they hit the top of their range (otherwise they would just keep singing up) but other than that it can remain disassociated from the notes of the range … Singing is such an interesting process for humans. It’s rare that a singer connects the difference between what they hear and feel, and what is actually happening, and the laws of sound are invisible. Couple that with the fact that singing is and emotional process, and is so connected to our souls (or should be) and you have something a lot more complex than playing an external instrument.